Crossovers become more agile when they drop some weight. 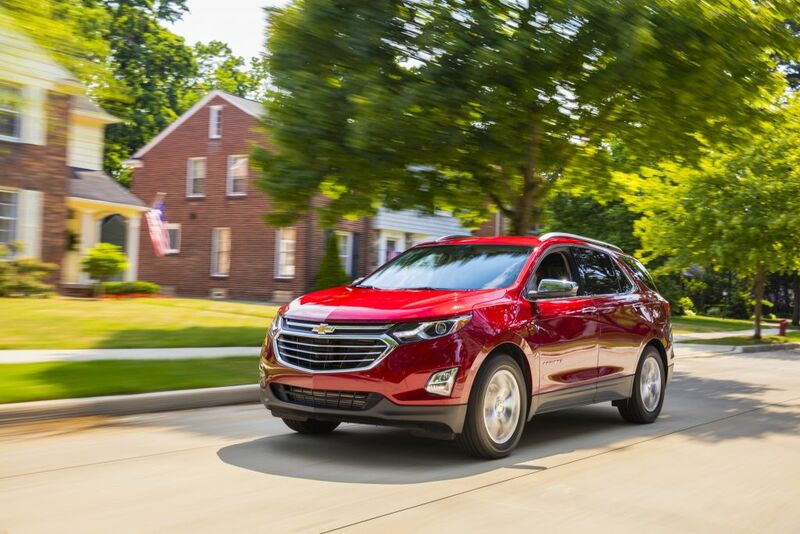 For the redesigned 2018 Equinox, shedding nearly 400 pounds —approximately 10 percent of its mass — pays dividends in a nimbler, more responsive and more refined driving experience. Combined with this weight loss, the all-new body was designed and optimized for top safety ratings. An all-new, mass-efficient body structure is at the center of the Equinox’s trimmer curb weight and helps make the most of the available turbo engine options. The 1.5L turbo engine offers a great balance of fuel efficiency and performance. For those looking for more power, the 2.0L turbo engine offers 252 horsepower (188 kW) and can click off 0-to-60-mph sprints in an estimated 7.2 seconds. That’s the quickest among Equinox’s three engine choices. The 1.5L turbo engine option is available in dealers now, while the 2.0L turbo engine option hits dealer lots later this month. Safety — The strategic placement of high-strength and ultra-high strength steel in the body structure is the foundation of a robust “safety cage” surrounding passengers. It is complemented with the Equinox’s restraint systems and other standard and available safety features to manage energy in the event of a crash and help protect occupants. Ride and handling — Greatly reducing the need to account for chassis flex in the suspension system’s tuning, the stiffer body structure allowed engineers to focus more on ride comfort and fine-tune ride and handling attributes with greater precision. It also supports hard-mounting the front and rear suspension cradles at six points apiece on the body, further enhancing nimbleness and responsiveness. Quietness and refinement — A stiffer body structure is better at preventing noise and vibrations, for a quieter and smoother ride. By helping to block noise and vibration paths, fewer sound-absorbing and other dissipative materials are required, contributing to the Equinox’s overall weight loss. Fuel economy — Lower weight makes a difference in fuel economy, and the 2018 Equinox delivers EPA ratings of 32 mpg and 29 mpg highway, respectively, for the standard 1.5L turbo and 2.0L turbo gas engines (FWD models). The Equinox’s new 1.6L diesel model offers a GM-estimated 40 mpg highway fuel efficiency. The 2018 Equinox’s body structure design was optimized with a mixed-material strategy for strength and low weight. More than 80 percent of the Equinox’s body structure is composed of high-grade steel materials, with high-strength steel comprising nearly 20 percent. The mixed-material design strategy employed to make the 2018 Equinox more responsive, refined and efficient is used on all recently introduced Chevrolet cars and crossovers, from the Malibu and Bolt EV to the 2018 Traverse. The all-new 2018 Equinox is a fresh and modern compact SUV featuring an expressive design, ample cargo space, Chevrolet’s latest connectivity, an expanded roster of available safety features and an all-new range of turbocharged engines — including the highly anticipated turbo-diesel. The spacious cargo area features new storage options such as a large, hidden underfloor storage space and a flat cargo floor that helps make loading and unloading easier. Purposeful technologies are designed to help passengers be safe, comfortable and connected. Teen Driver is offered, along with safety features such as Safety Alert Seat, Surround Vision, Forward Collison Alert with Following Distance Indicator and more. The 2018 Equinox is on sale now, starting at $24,525 (including destination charge). Tax, title, license, and dealer fees extra.